Let’s face it. Some cacti are hard to please. For the best results, beginners should start with ones that are easy to grow. The hedgehog cactus are carefree plants that are suitable for beginners. These plants are also called pitaya (Echinocereus spp.). Their needs are simple. Give them a sunny spot in the warm months, and water them when they need it. During the winter, keep them very dry, and you should have no problems. If you’re lucky enough to have a greenhouse or live in a warm climate, you should be able to harvest edible fruits from Echinocereus triglochidiatus. The different species of hedgehogs can vary considerably in shape. Find a bright, sunny spot for them, and you’re sure to succeed with the mammillarias. 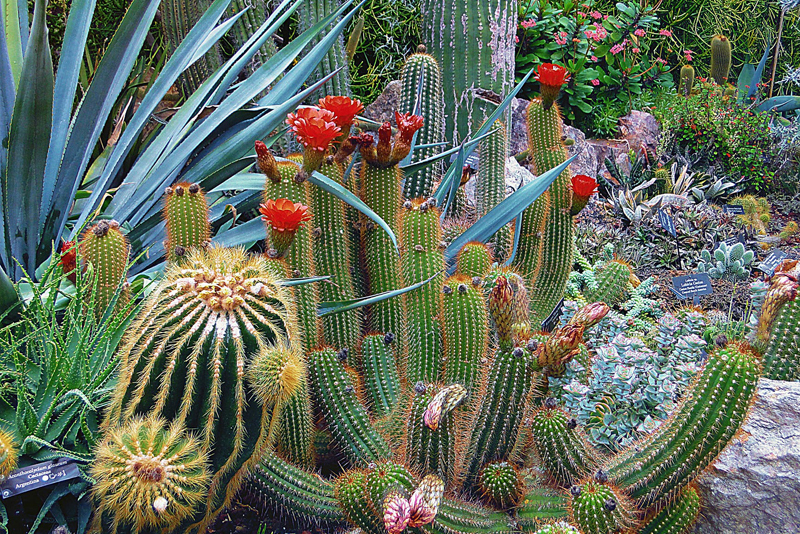 These are among the most popular of the cacti, probably because they will bloom every year. There are hundreds of species of mammillaria. They are native to the U.S., Mexico, Central and South America. With their distinctive cylindrical or globular shapes, they’re easy to recognize. The name mammillaria is from the Latin word ‘mama’, which refers to little warts. Beginners will never go wrong when they choose the night-blooming cereus (Selenicereus spp.). Queen-of-the-night (Selenicereus grandiflorus) is noted for its particularly spectacular nocturnal blooms. About a foot long, their fragrance is reminiscent of vanilla. There is a species with similar blooms known as princess-of-the night, but its flowers lack fragrance. The various species of night-blooming cereus are native to tropical areas of South and Central America. They tend to have pendant stems that either climb, hang, or creep. Despite their strange appearance, the Pereskias are classified as cacti. They’re one of the few cacti that have leaves. In their native habitat, they assume a tree-like or bushy shape with a spiny trunk that can be about eighteen feet tall. Its spines are produced at the leaf axils. The leaves can be reddish-brown to green. The plants are native to tropical America and south Florida. Some will have fragrant blooms. The Epiphyllums or orchid cacti are almost foolproof. In the winter, they need frost-free cool temperatures. These epiphytic species are native to warm, humid areas of South America and Mexico. The spectacular blooms are produced in the warm months from spring through the summer. Now there are many hybrids available with flower colors ranging from various shades of red and pink to yellow and white as well as bicolors. Those of the original species tend to be either red or white. Like the other epiphytic cacti, they need some shade during the summer months. The holiday cactus, including the Easter cactus, Thanksgiving cactus, and Christmas cactus, are related to the orchid cacti. These are easy-going plants that are suitable for beginners.